At various places in and around Gstaad, you’ll find 14 animal sculptures and paintings by the artist Davide Rivalta. These works are standing or hanging on the grass by Le Grand Bellevue, along the Promenade, in Park Gstaad, in the garden of Gstaad Palace and on the Eggli. The exhibition is named Leniency. It’s so unusual that everyone is in for a surprise. Sooner or later, you’ll come across one of the exhibits. On the way from Untergstaad towards the Promenade, look out for three proud lions on the left. In front of the BEKB, take note of the pack of wolves as they wait for a member who is still sniffing around in front of the tourist office. 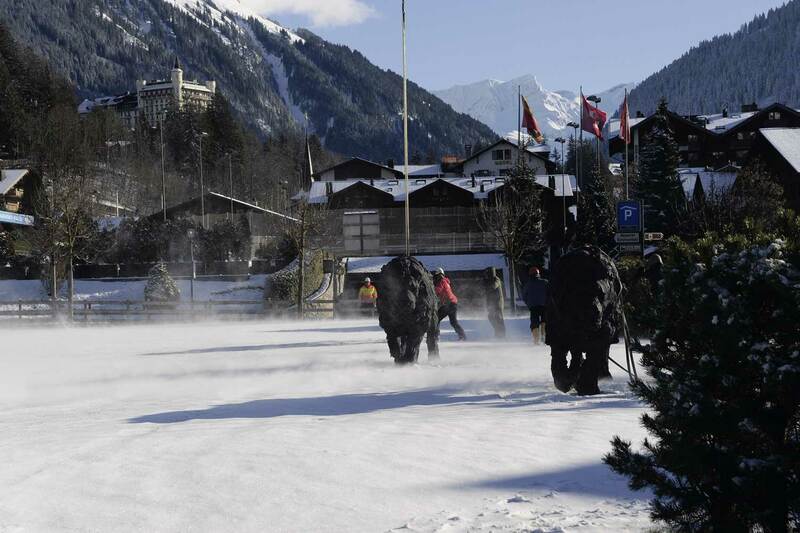 Three buffaloes explore the garden of the Gstaad Palace but never get too close to the rhino. They know, of course, that this heavy pachyderm can be one of the most aggressive animals in the wild. So, the rhino is left in peace to bathe in the pond on the hotel terrace. Winter sports enthusiasts and day-trippers to the Eggli can relax in closer proximity to the exhibits as an eagle perched by the mountain restaurant is wondering where to fly off next to catch his prey. Meanwhile, a bear near the mountain station chairlift is searching for food under the snow. Park Gstaad has two eagles, a Rottweiler and a cheetah. All four seem to fear the cold so much that they don’t want to venture outside the comforting warmth of the hotel. Born in Bologna, the artist lives and works in his hometown. He studied at the Accademia di Belle Arti, where he currently teaches sculpture. When asked how he came up with the idea of choosing wildlife as subjects, Davide Rivalta replied: “In 1998, I took part in a competition and the winner was allowed to exhibit their works in the courtyard of the Ravenna Palace of Justice. My gorillas won first prize and that was the beginning of my enduring passion for creating animals.” The artist emphasises that he’s familiar with every creature he depicts in bronze, stainless steel or aluminium. In a game park near Bologna, he observes and studies these creatures closely. Then, he turns them into true-to-life replica sculptures using his very own hands. His works have been exhibited in Modena, Rome, Nagoya and Antibes, among other prominent places.